Construction is underway on the ice castle in Dillon, Colorado. Ice making crews started the construction process of the ice castle last week. Dillon is host to this atraction after not hosting the event for the past few years. The Utah-based company Ice Castles anticipates the Dillon ice castle to open in late December 2017. A team of ice artisans will spend about 4,000 hours dripping, shaping and hand-placing icicles while embedding them with color-changing LED lights. Each day, ice artisans will grow and harvest up to 10,000 icicles to build the acre-sized winter castle. They will spend weeks growing and collecting millions of pounds of icicles to create palaces (which have soared as high as 40 feet in years past). Once comleted, the Ice Castle is estimated to weigh roughly 25 million pounds. Features are to include ice-carved slides, tunnels, fountains and thrones. The castle in Dillon is one of six ice castle locations in North America. The other ice castle locations include Midway, Utah; Stillwater, Minnesota; Lincoln, New Hampshire; Edmonton, Alberta; and Winnipeg, Manitoba. Wear Boots or shoes with warmth and grip! The walking surface inside the ice castle is made of crushed ice and it can be chilly. Photos are encouraged! Take as many as you’d like but make sure you tag #icecastles. You don’t have to worry about falling icicles, but you do have to worry about the castle melting before you see it. 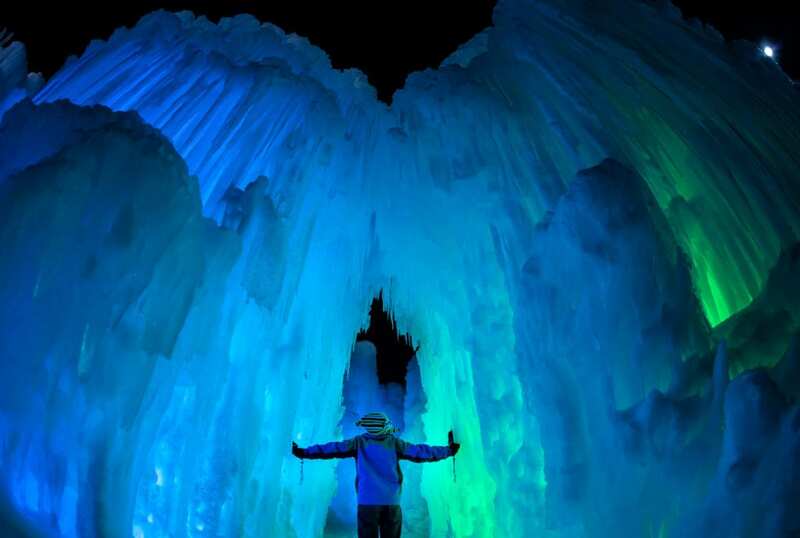 The ice castle typically lasts six to eight weeks due to fluctuating temperatures. Enjoy a high-energy fire show before entering the ice castle! Fire breathers will amaze you with a versatile and unique show. They use many different manipulation props that include fire breathing, spinning, hula, and more. Fire shows take place on Friday and Saturday from 7-10 p.m.
*Holiday pricing is the same as weekend pricing.